As 5G rolls out across the world Apacer has introduced an industrial wide-temperature DDR4 2666 memory module, made solely with ICs supplied by Samsung to produce product differentiation. The company is expanding its business into industrial applications driven by intelligent connectivity, and this product will enable manufacturers to pull ahead of their competition in the 5G market. The company insists on using industrial-grade chips from original manufacturers in its DDR4-2666 high-performance wide-temperature memory. This can ultimately avoid the high malfunction rates of commercial IC products working in extreme temperature environments. 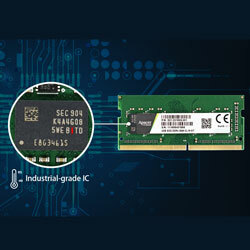 The company is dedicated to using industrial-grade ICs to produce wide-temperature SSD and memory. The development of 5G will accelerate AI from the cloud to the edge. The company’s high-performance wide-temperature memory product line includes UDIMM, SODIMM, RDIMM, ECC UDIMM and ECC SODIMM specifications. All of these are able to support the highest level of anti-sulfuration technology to stop accelerated resistor sulfuration due to high temperature, and they come in 4GB to 16GB capacity options.